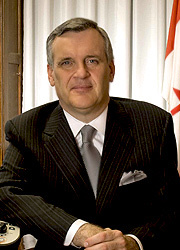 The Honourable David C. Onley was appointed Ontario’s 28th Lieutenant Governor in 2007 following a distinguished career as a broadcaster. His Honour, who serve as the Queen’s representative in Canada, has chosen to champion disability issues and served as Chair of the Government of Ontario’s Accessibility Standards Advisory Council and was an accessibility council member for the Rogers Centre and the Air Canada Centre. As the first Ontario Lieutenant Governor with a physical disability, His Honour has adopted ‘Accessibility’ as the overarching theme of his mandate. He has defined Accessibility as that which enables people to achieve their full potential, and believes that true Accessibility occurs when disabled people can fully participate in the social, cultural and economic life of Ontario. Because Accessibility includes equal access to opportunities like education, His Honour is expanding the Aboriginal Youth Literacy Programs to include computer literacy initiatives. His Honour was born in Midland, Ontario and grew up in Scarborough. He was inducted into the Terry Fox Hall of Fame and the Scarborough Walk of Fame. He is the recipient of the Rick Hansen Award of Excellence, the Courage to Come Back Award, and holds nine honorary degrees. Shuttle is his honour’s first novel and was nominated as Book of the Year in 1982 by the Periodical Distributor’s Association.